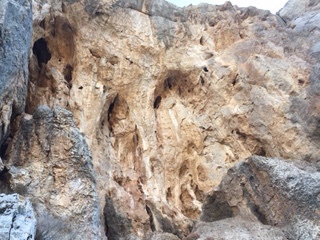 My family and I recently spent some time climbing the limestone sport routes around the Mesquite area, about an hour north of Las Vegas. We visit the Southwest most winters, looking for a little escape from the South Dakota winter, and have always enjoyed Red Rocks, Joshua Tree, and Bishop. But this year we were looking for something new, and as we travel as a family with two young kids, we were looking for climbing conducive to the family unit. 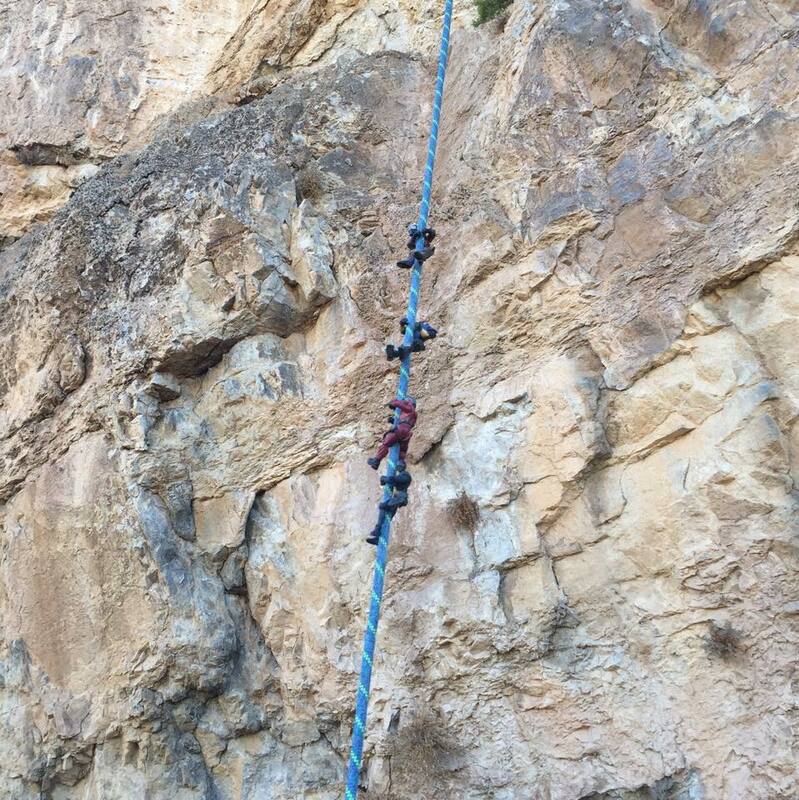 We’d climbed St. George’s sandstone and visited the VRG before, but we’d never even heard of the other, amazing limestone walls we visited this year. We were not disappointed in what we found around Mesquite! To be precise, none of the climbing around Mesquite is actually in Mesquite, or even in Nevada for that matter; the climbing is either northeast into Utah (in the “Southern Utah Hills,”) or more southeast into Arizona. Mesquite acted as a nice intermediate point for us so to stay in. On the Utah side, our favorite crag was the Cathedral and its adjoining Wailing Wall. The Cathedral is mostly steep cave-climbing, on smooth, beautiful blonde rock. If you like grabbing slopers and thuggish-style movement, you’ll love the Cathedral! With slick, often small feet under you, you need lots of body tension and faith in what you cannot see! Right next door is the Wailing Wall, which is surprisingly different than the Cathedral even though it’s all a part of the same wall of rock. The routes of the Wailing Wall have more friction than the polished routes of the Cathedral, and they are also less steep, with vertical to slightly-overhanging lines. At the Wailing Wall you get to grab bomber crimps, pinches, gastones and sidepulls. 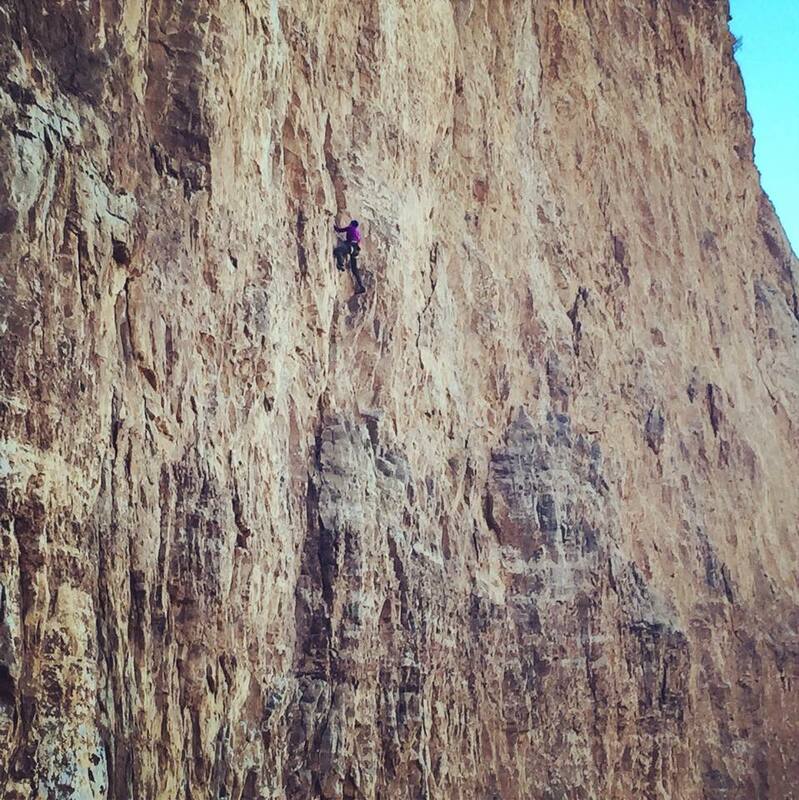 Another feature I loved about this area is that the routes on both walls are long, many over 100 feet. Over in Arizona, we spent most of our time at Lime Kiln Canyon, a gem of a crag not yet in any guidebooks, though it seemed to be a well-known crag in the area. 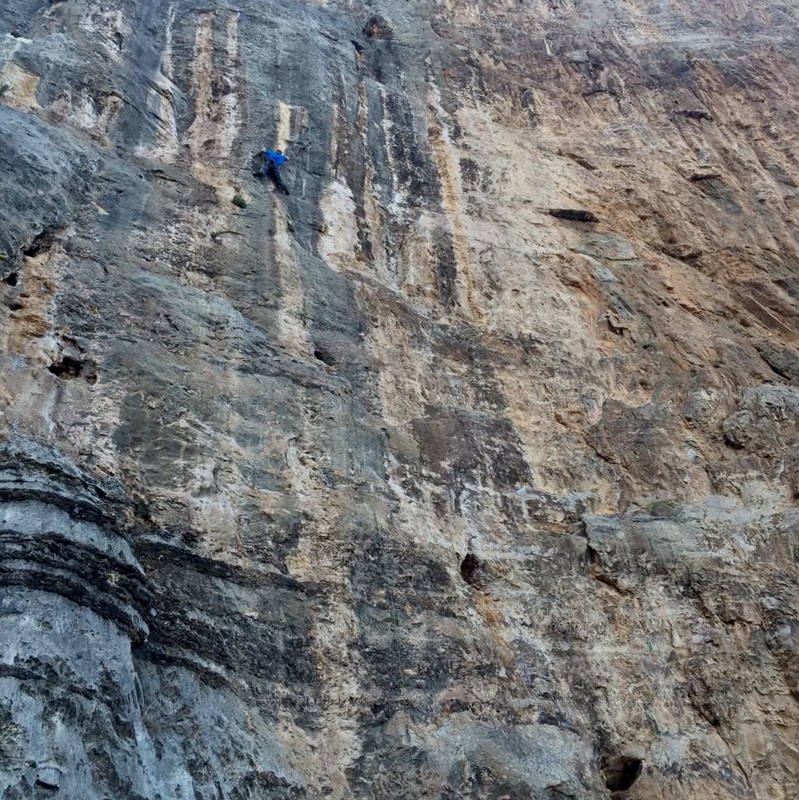 Like its Utah-counterparts, Lime Kiln has long routes, many multi-pitch. Most routes have midpoint anchors to help get you back to the ground, but it’s still nice to have a 70 meter rope, or even an 80 meter if you can stomach using that trad rope for sport climbing! 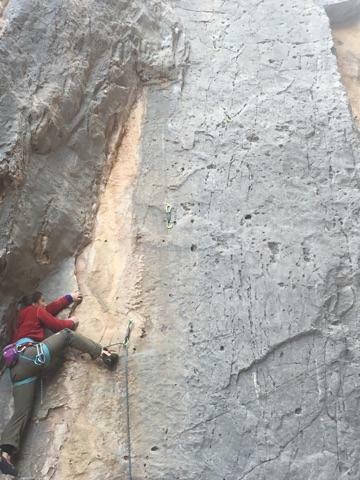 🙂 I loved Lime Kiln, and have decided it is my favorite climbing destination away from my local crag in South Dakota, Spearfish Canyon. 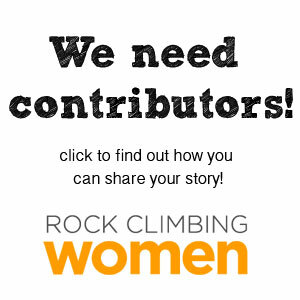 Lime Kiln has slabby to vertical climbs, with tons of moderate climbing as well as the “hard stuff.” Good footwork and creative body positioning allow a climber to keep going for over a hundred feet without letting the pump overwhelm them entirely. Most routes have a noticeable crux or two, with the rest of the route containing endurance-building, 5.fun climbing, as well as multiple get-it-all-back rests and a plethora of positive foot and hand holds; being a short climber, I appreciated all the intermediate holds I was able to find and use! The limestone at Lime Kiln is very featured and textured, with toothy feet- and hand- holds that grab you and keep you on the route. And as I mentioned before, we’re a family of four (with a dog to boot! ), and we found the Mesquite area to be much more laid-back and less-busy a scene than the Vegas one. Climbing at Red Rocks, I’m always plagued by a feeling of trying to keep the kids quiet and our stuff confined to a small little corner; while at the Cathedral or Lime Kiln, we had space to hang out and enjoy ourselves without worrying too much about noise from the kids’ GI Joe games, or about the route we’re working getting taken over a group of 10 “gym rats” that rush in and hog the routes! J And finally, on rest days, it was so easy and affordable to take the kids swimming at the Mesquite Rec Center, or bowling and arcading at the Virgin River Casino. 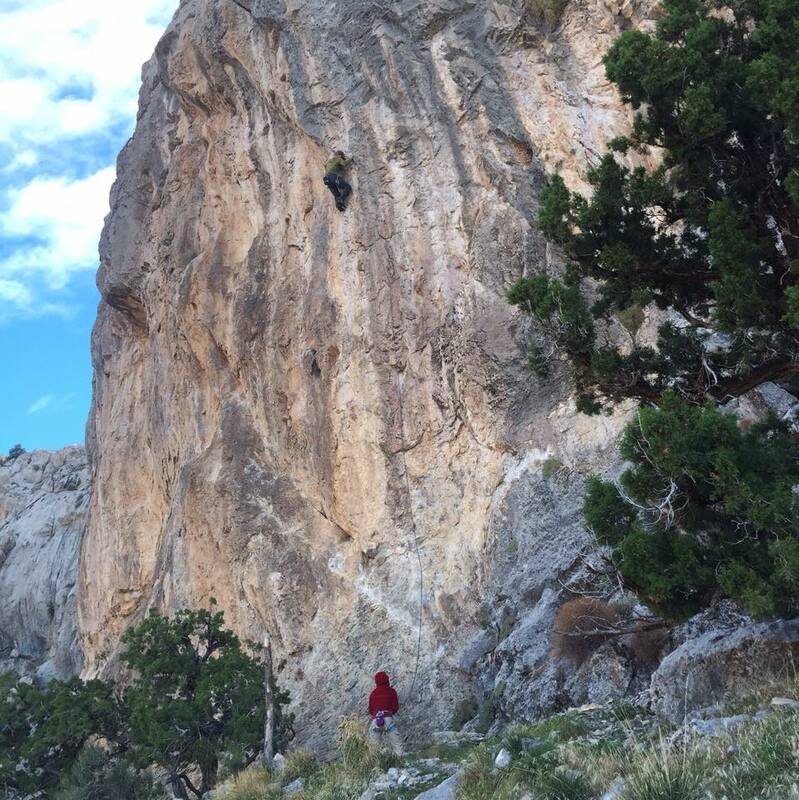 In sum, we all enjoyed the Mesquite area immensely, for the climbing and for the hang!